A groundbreaking system that enhances the learning experience of kids' favorite programs by enabling them to interact with their favorite television shows and characters. 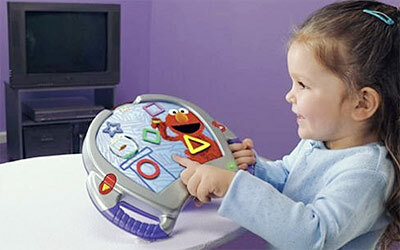 The hardware includes a child-friendly remote, a bonus DVD, three activity cards, and a DVD case. The infared remote control is compatible with most DVD players. The activity cards overlay on the remote and contain nine potential touch points and act as the interactive mechanisms that allows the child to navigate through the footage and game play screens that are contained within each title. Additional software titles are sold separatley and include Dora the Explorer, Sesame Street, Spongebob, Barney, and Blues Clues.